In the beginning Benevilla (originally known as Sun Cities Area Interfaith Services) was a group of 30 volunteers helping with errands and home care services and a handful of employees. Started by and for our community in 1981, Benevilla enriches lives of West Valley residents by serving older adults, adults with disabilities, children and the families who care for them. A better quality of life for everyone at every age. Each Benevilla Life Enrichment Program features specialized programming to meet specific needs – from memory care, to physical therapy, to intellectual challenges. Members benefit from a “person-centered care” philosophy and the support they need, while caregivers receive the resources they need to energize themselves. Identifying the strengths that each member possesses and working with them to make the most of those opportunities is the focus – which ultimately assists them in preserving their memory, their physical strength, and achieving optimum self-confidence. Our programs are home-like, friendly and specially designed to best serve member needs. We offer services such as spa like showers and assisted bathing, so caregivers don’t have to handle this sometimes difficult task on their own. The settings for all services of this nature are comfortable and relaxing and all Benevilla Life Enrichment programs are conducted by sensitive, well-trained staff whose first priority is your comfort. Chef prepared meals from Birt’s Bistro, our unique artist-in-residence program or a visit from a "BenePets" therapy pet are just some of the other special programs we provide every day. Lucy Anne’s Place is specifically designed for people who have early to moderate stages of Alzheimer’s and other Dementias. The optional inter-generational program promotes unique interactions between Members enrolled in Lucy Anne’s Place and children enrolled in Wirtzie’s Preschool. For those experiencing moderate to advanced Alzheimer’s and other related Dementias, our customized memory-care program combines health care and life-enriching therapeutic programming to meet the unique needs of each individual. Designed for those who have Parkinson’s, early to moderate Alzheimer’s disease, are a survivor of a stroke, or have had a fall-related injury. This program offers specially designed exercise equipment and staff trained in Restorative Therapy. 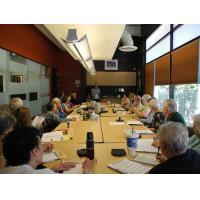 This program supports those who live in Peoria, Glendale, and Phoenix. We welcome stroke survivors, those with Parkinson’s, dementia, and older adults with intellectual disabilities. The Benevilla Family Resource Center (“FRC”) is dedicated to helping parents prepare their children (0-5 years) to start school healthy and ready to succeed. The Benevilla Family Resource Center is an ideal place to go if you’re a young parent raising a child. But where do you go if you’re a grandparent raising the next generation? The Benevilla Grandparents Raising Grandchildren (GRG) program, a part of the Family Resource Center, is the answer. For grandparents dealing with the challenges of raising grandchildren, it’s not just about being there as a parent. Benevilla knows that art programs help people to become more socially engaged, enjoy better health, and find greater happiness. Our Creative Aging program provides opportunities for local artists and local community members to collaborate. Programs include: Artist in Residence at Benevilla Life Enrichment Programs, Birt’s Happy Hours, Birt’s Boutique, Memory Arts Bistro, Benevilla Artist Gallery, Art in the Garden, Creative Aging Series and more. Taking care of someone can be difficult. Support groups offer friends who can relate to your daily ups and downs, and professionals who offer information and assistance. 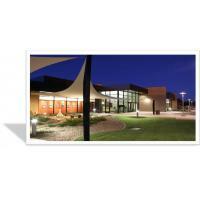 For 35 years Benevilla has been providing the education and information you need free of charge. We can answer a wide variety of questions like, how to find a ride to the doctor or how to find a reputable home care service. Our highly trained Resource Specialists have access to a database of over 1,000 providers and agencies, including Benevilla member and volunteer services, community businesses, government agencies, and other resources to help you remain independent at home. Our Resource Specialists are available to talk during business hours at Birt’s Bistro on the Benevilla campus, no appointment needed. 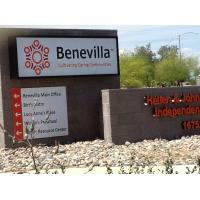 Or, to speak with a Specialist today, call 623-584-4999 or email socwork@benevilla.org. All information is strictly confidential. 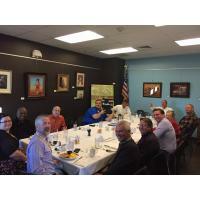 A restaurant on the Benevilla main campus in Surprise, whose social enterprise model helps to support the charitable work that Benevilla does in our community. Every time you visit Birt’s for a delicious freshly prepared meal, buy $1 used book at the bookstore, make a purchase at the Boutique, attend the Friday night Happy Hour Concerts, or even cater an event, you are giving back to Benevilla programs. Birt’s Bistro Catering provides high quality services for events of all kinds, special occasions, parties, meetings and more. The Birt’s Bistro trained chefs and event staff will ensure that your event is one that is completely memorable and uniquely special. Staying current on industry trends, we pride ourselves on creating delicious food, as well as unique, customized service. But more than this, we have a desire to create memorable occasions for our community members. With every service purchase, you are directly supporting the work Benevilla provides for your friends and neighbors. 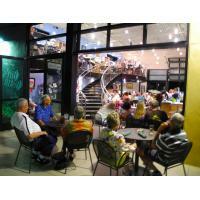 Birt’s Bistro is a social enterprise for Benevilla. There are C.A.R.E.S. Specialists on site available free of charge for people needing information about community resources. Birt’s even offers a Group Supported Employment program which trains and employs members from our Helping Partners Life Enrichment program in various capacities at Birt’s and Benevilla. Designed to provide an environment that would enhance and enable learning and community while providing quality child care for ages 1 to 5. From our unique architectural design to drafting the staffing plan, every decision was made with the goal of celebrating individuality and providing a safe, nurturing place for your children to learn and develop. The Surprise Community Garden provides opportunities for members of the community to work together, growing healthy food while learning from each other. The Surprise Community Garden, opened in 2012, is a Community for All Ages (CFAA) program led by Benevilla in partnership with the City of Surprise and Rio Salado College. 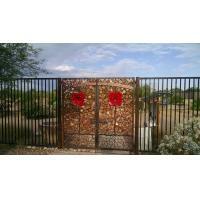 The garden is located on the Benevilla campus at the Hellen & John M. Jacobs Independence Plaza, 16752 N. Greasewood Street in Surprise. Need help getting your groceries? That’s where our volunteers come in! Home Service Coordinators assign volunteers to clients. The volunteer collects the grocery list for the week, shops at the participating grocery store, delivers the groceries directly to the client, and returns to the store with the client’s payment, providing the personal care and assistance that forms long term relationships. Need to get to that doctor’s appointment, but can’t drive? Volunteers pick clients up at home and transport them to appointments such as medical visits. The volunteer waits during the appointment and then takes the client home. This arm in arm service provides a social opportunity and comfort level rarely found in other transportation services. Having trouble organizing your affairs? Have you lost a spouse who previously handled all of the family business? Trained volunteers visit clients at their home and help them organize personal, business and financial matters. Need someone to fix that faucet or change that ceiling light bulb? Skilled volunteers make minor home repairs for those who are unable to manage these tasks themselves. Feeling all alone? Friendly Visitors provide clients with company and companionship in the comfort of the client’s own home. Visits can include work on a craft project together or simply be a time to chat. Phone Pals call clients on a regular basis for enjoyable conversation and wellness checks. All programs are supported by more than 1000 volunteers and 100+ employees – that seek to help keep people independent and in their own homes. By building a caring community of neighbors helping neighbors, Benevilla is able to provide extensive support services for older adults, adults with disabilities, children, and the families who care for them. Benevilla programs are supported through donations from individuals, congregations, service clubs, and corporations. These generous individuals and organizations ensure we can meet the needs of our community today and in the future. Benevilla provides a continuum of care that promotes independence and instills a sense of dignity and self-empowerment, regardless of the ability to pay. We recognize that caring for the needs of senior adults reaches beyond the individual to the entire family. Not only do our well-established services offer assistance to senior clients, but many programs address the ongoing and changing needs of caregivers and families. 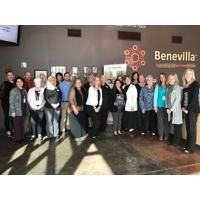 With an eye on future needs for both older adults and the younger generation, Benevilla has established an intergenerational program opportunity. The program includes Wirtzie’s Preschool and Child Care and Art’s Center for All Ages, where children from 1 to 5 years old have the unique opportunity to share space and experiences with older adults. 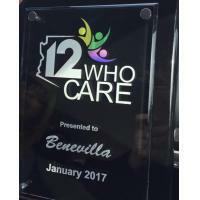 Benevilla is licensed by the Arizona Department of Health Services (DHS) and maintains service contracts with the Area Agency on Aging, the Veterans Administration, the Division of Developmental Disabilities, and others. An organization committed to quality, compassionate care, Benevilla is committed to building caring communities.